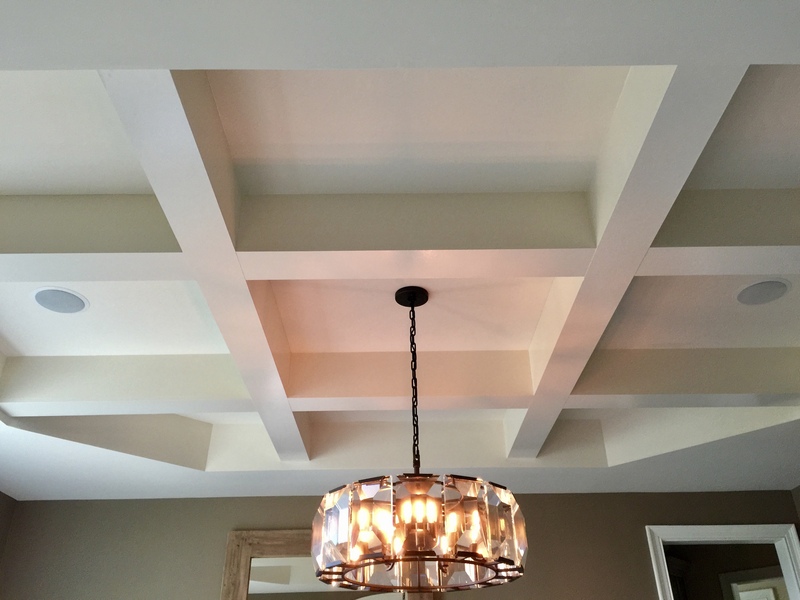 For our coffered ceiling we did not add any crown molding or additional accents to the grid. We want the style to be modern farmhouse and transitional, giving the appearance of beams on the ceiling. Adding crown molding gives the space a more traditional look. As I mentioned above, we redesigned the entire room. In this redesign, we removed the elaborate crown molding from the room. You can read about the complete dining room transformation (HERE). After removing the crown molding and prepping the ceiling well, we begin designing the grid. The space we are working with is a tray ceiling in the shape of an octagon. Using a tool to create a chalk line (HERE) is the easier way we have found to do projects such as this coffered ceiling. Notice multiple chalk lines? That’s one of the benefits of using this tool, it allows you to visualize where the boards will be placed. On the first try, I decided the beams weren’t wide enough apart, so we created a wider space for the beams using the chalk line. We also adjusted the spacing of the boxes, taking into account the chandelier in the middle and the speakers on either side. We began with creating 9 similar sized spaces, but decided the space would look better with larger boxes in the middle row, (with the chandelier and speakers) and smaller spaces at the corners. We had these challenges because we are working in an octagonal space, if the room was square, I believe the spacing would have been easier to achieve. We attached 1″ x 6″ common boards to the ceiling. These boards will be used to attached our wood panels to, they are 1″ thick and 6″ wide. Using WindsorOne 8″ boards, we start nailing the boards to the common pieces of wood (HERE). The Bostitch is our nail gun of choice. The beams are 6″ wide and 8″ high. We nail in the last of the bottom boards to the side pieces. Now the caulking begins (HERE), it goes quickly using a caulk gun (HERE). We painted the ceiling using a semi-gloss paint and it looks beautiful! Thanks for stopping by, I hope I inspired you to take on a new home project. Remember to follow along on Instagram and see you next time! Symmetry is beautiful and that ceiling looks so much more appealing now. Thank you! Definitely took some trail and error.